Tyler made a couple high-profile appearances in national media stories recently. If you didn’t catch them, we wanted to share, along with another national article we suspect you’ll really like. Here’s what we’ve been reading lately—and if you’ve come across something great recently that you’d like to share, please drop a link here on our Facebook page! Is Education a Fundamental Right? If you’re ever attended a public school board meeting in Tyler, you’ve probably been in the Jim Plyler Instructional Complex, a nondescript facility at the southwest edge of the Azalea District. What you might not know is that in the late 1970s, former Tyler public schools superintendent Jim Plyler was at the center of an incredibly consequential—though little known—Supreme Court decision regarding American education. The case examined whether undocumented children in Tyler had the right to attend public schools for free, like all other children in the district. The New Yorker magazine recently unpacked the case, and how it could shape modern-day cases being fought over the same issues. “Before sunrise on a morning just after Labor Day, 1977, Humberto and Jackeline Alvarez, Felix Hernandez, Rosario and Jose Robles, and Lidia and Jose Lopez huddled together in the basement of the United States Courthouse in Tyler, Texas, the Rose City, to decide just how much they were willing to risk for the sake of their children, for the sake of other people’s children, and for the sake, really, of everyone,” the piece begins. For more on Tyler’s outsized role in shaping our views—and laws—regarding public education and questions of access across Texas and the country, here’s our 130-year timeline of race and education in Tyler, with appearances by several figures you’ll read about in the New Yorker piece. A lot of national reporting on local issues gets fairly pegged as “parachute journalism”—a pejorative term for the work of a big-city reporter who drops in from afar for a day or two, stuffs their notebook with cherry-picked quotes that amplify stereotypes and flatten local complexity, and then dashes off to the next far-flung outpost, leaving a trail of rightfully pissed-off locals in their wake. This piece from Buzzfeed News is not that. Reporter Hannah Allam captures important truths about what it has long meant to “belong” in a place like Tyler, how the desire to belong can bump up against other parts of one’s life, and how all of that might be changing. She did that through careful, patient, and thoughtful reporting—so good that I’m kicking myself that The Tyler Loop didn’t tell this story first. Hats off. My last pick isn’t specifically about Tyler. 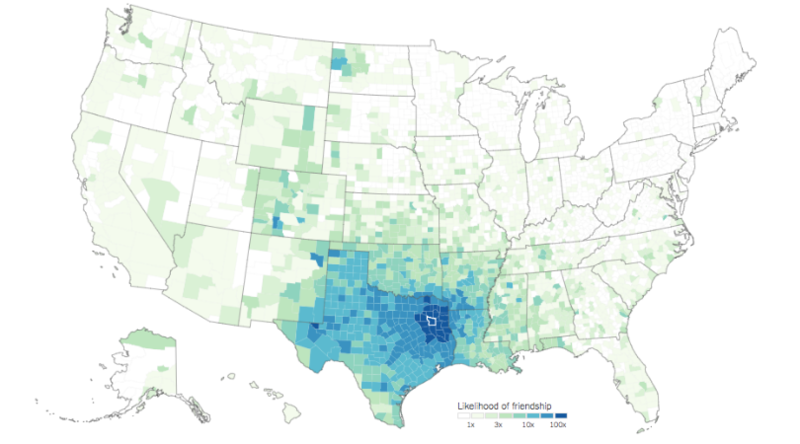 It’s an interactive project from The New York Times analyzing gobs of Facebook data to determine how far Americans tend to live from the people they’re friends with (or at least, friends with on Facebook). “America is often described as a place of great divides — between red and blue, big cities and rural towns, the coasts and the heartland. But our social lives are shaped by a much stronger force that ignores many of these lines: distance,” the piece begins. Turns out that most Americans live much closer to the bulk of their friends that you might expect, even in this age of social-media-enabled digital community. And that means the ideas, perspectives, and information we’re exposed to are still deeply influenced by the people around us. You can look up Smith County to see how local patterns compare to national ones, and see which counties are most closely connected to our own. Maybe someone can explain why there seems to be a strong connection between here and Loving County, way out on the western edge of the state? Or between Smith County and Colorado’s Hinsdale County, in particular? Tell us on Facebook. Read something recently that helped you better understand Tyler, or Texas, or the rest of the great wide world? We’d love to read it, too—or watch, or listen. Share your recommend stories on our Facebook page! Thanks for reading this story. Just one more thing. If you believe in the power of local journalism here in Tyler, I'm hoping that you'll help us take The Loop to the next level as part our winter membership drive. Our readers have told us what they want to better understand about this place we all call home, from Tyler's north-south divide to our city's changing demographics. Power, leadership, and who gets a seat at the table. How Tyler is growing and changing, and how we can all help it improve. Local arts, culture, entertainment, and food. To tell those stories, we're hoping to add 50 new members this year. For $15 a month—the cost of a nice lunch—you can significantly increase our ability to do the big, hard-hitting, complex Loop stories and interviews you know and love in the coming year. If you're one of the first 25 new members to sign up, we'll be delighted to share with you one of our first-ever Loop t-shirts, featuring our new piney-woods inspired colors and logo. Hot off the presses, folks! Support The Tyler Loop—and get one of our new t-shirts! Next articleThere are over 22,000 college students in Tyler. Why don’t they vote?